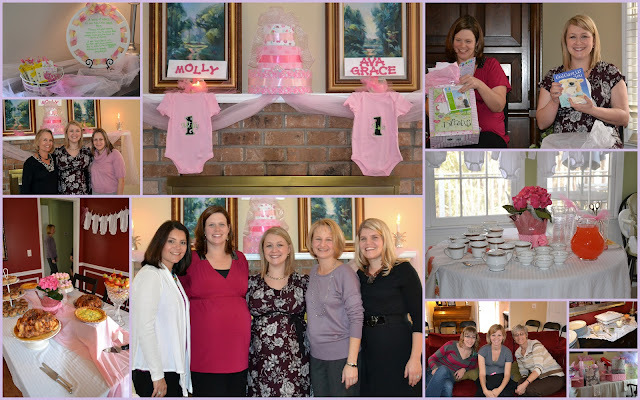 A couple of weekends ago some wonderful friends threw a shower for Molly and her soon-to-be BFF Ava. It was originally going to be a surprise, but I guess they knew both Kelly (Ava's mommy) and I are over-planners, so they ended up telling us where to be and when... but that's it. When I arrived at the shower (a few seconds behind my rather large belly), it was pink and tulle and girly-ness everywhere! The hostesses put together such a sweet shower and we were super blessed; I'll just brag on them with a few fun highlights. Let's start with the food. The shower was at 10:30, so it was brunch type food. I could stop at grits bar for sure, but I will go ahead and tell you there were fruit skewers, quiches, and pull-apart gooey bread too! The pink tulle started with the big bows on the porch and just kept going... Just inside the door (top left picture) was a cute little poem accompanying the guest favors. I couldn't believe all of the fun personalized gifts incorporated into the decor. There were two clotheslines of purple and pink month-by-month onesies (you can sort of see them behind the food table and above the beverage table), and then each baby girl also had a pink onesie monogrammed with her name and a "1" to wear on her first birthday. We also got to take home diaper cakes wrapped in girly receiving blankets, and beautiful pink hydrangea centerpieces, each with a pink headband wrapped around it. (Anyone want to come plant mine for me?) The girls put together pink scrapbooks for Molly and Ava and had shower guests sign the first page. Oh, and I even have a cute monogrammed burp cloth; it marked Molly's section of the gift table. I was so impressed by their creativity! Thank you to everyone who was able to come out and celebrate Molly. The biggest surprise was my sister-in-law Emily flew in from L.A. for the weekend. It was so special to have her there! We were super blessed by everyone's sweet words and gifts... this little girl will not be wanting for anything... unless it is closet space! :) I mentioned yesterday that I was glad we named Molly before the shower because it allowed for all of the fun, personalized details, but the best part by far was the gift of friends praying over Molly by name at the end of the shower. Can't believe we're less than two months away from meeting our sweet girl!